A series of mysterious and uncanny architectural, artistic, and religious parallels connect the ancient Maya and Egyptian civilisations. Some of these parallels have been noted and proclaimed by nineteenth century scholars; others have been discovered in the past several decades. 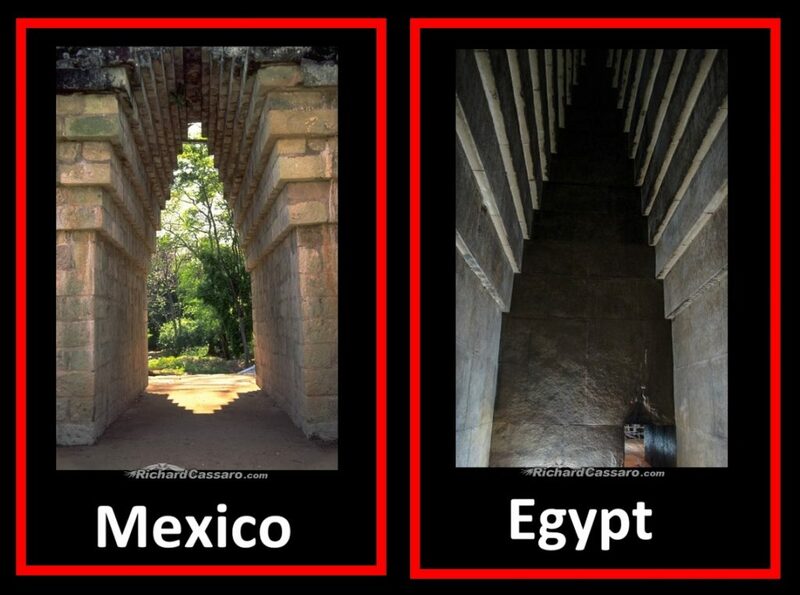 Over the past twenty-five years of research into ancient civilisations, I’ve uncovered and explained many such parallels, and have come to believe that these parallels are more than mere coincidences. Such close parallels are enigmatic, even problematic, as the Maya and Egyptians sprung up independently on opposite sides of the Atlantic Ocean (pre-classic Maya in the Yucatan c. 2000 BC vs. dynastic Egyptians in Africa c. 3150 BC). The two cultures don’t appear to have been in contact, as there are no records of trade, war, or communication between them. How, then, can we explain the similarities? Faced with this enigma, many Victorian-era scholars and archaeologists believed that the Maya and Egyptians were children of the same mother culture—an advanced civilisation so old that memory of its existence has been lost to time. Such theories went out of vogue well over a century ago, but I believe that this rejection was premature, for reasons outlined in my latest book and reviewed briefly here. 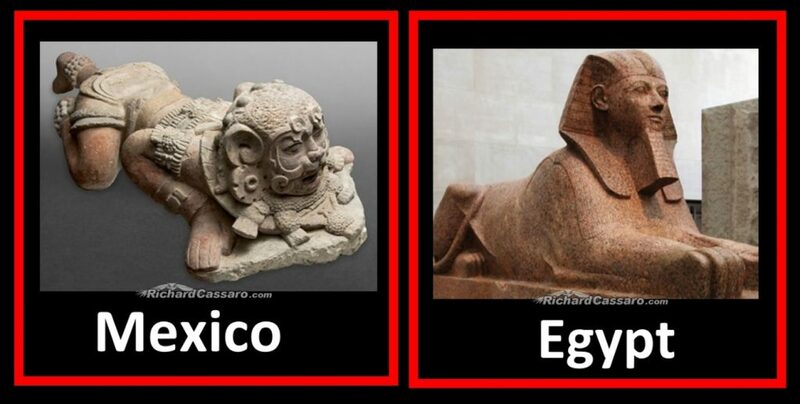 Ever since my first back-to-back research trips to Egypt (1996) and Mexico (1997), I’ve been discovering, researching, and presenting profound cultural parallels shared by ancient civilisations worldwide. The Maya/Egyptian parallels are among the most striking. Some of these parallels were recognised by Victorian and pre-Victorian era scholars and writers like Charles Etienne Brasseur de Bourbourg, Edward Herbert Thompson, Augustus Le Plongeon, Ignatius Donnelly, and Zelia Nuttall. Many of these scholars credited Plato’s lost continent of Atlantis with being the source of the similarities. Other parallels I’ve discovered through my own original research and investigation. The Victorian-era idea that the lost continent of Atlantis was the source of the parallels (i.e., a theory called “diffusion”) has fallen out of favour with scholars over the past several decades. As a result, nineteenth century ideas have been shelved in favour of a new theory called “independent invention,” which holds that ancient inventions, such as pyramid construction, naturally occurred in more than one place at the same or different times. As the Paul McCartney/Michael Jackson duet “Ebony and Ivory” put it, “people are the same wherever you go.” This “independent invention” theory has notably been maintained by modern scholars like Kenneth Feder, professor of archaeology at Central Connecticut State University. In my 2011 book Written in Stone, I revived the theory of the Victorian-age scholars, and took their work a step further, by exploring new evidence for the possibility that a primordial “Mother Culture”—now lost to time—flourished during a prehistoric “Golden Age.” In my subsequent books, articles, videos and lectures, I explained how this Golden Age was documented by the Hindus, Greeks, Romans, Aztecs, and other ancient civilisations; and I hypothesised that this Mother Culture may have been the source of the parallels shared by the world’s first cultures—a kind of “missing chapter” in the human story, as Graham Hancock puts it. Are the following “10 Mayan & Egyptian Parallels” evidence that a sophisticated Golden Age civilisation—now almost completely forgotten—once existed in the ancient past, and was a kind of “Mother Culture” to the world´s first “known” cultures, like the Egyptians and Maya? Left: Pyramid of Kukulkan in Chichen Itza, Mexico. Right: Saqqara Pyramid in Saqqara, Egypt. Both the Maya and the Egyptians built pyramids. In fact, both cultures didn’t just build pyramids, they built similar “step pyramids” (i.e., pyramids with a series of steps leading upward toward the apex), as we can see here. Left: a stone serpent within sight of the step Pyramid of Kukulkan at Chichen Itza, Mexico. Right: a series of stone serpents within sight of the step Pyramid of Saqqara, just outside Cairo, Egypt. What are the chances that two unrelated civilisations separated by the Atlantic Ocean would have come up with not only “step pyramids,” but also adjacent or nearby stone serpents? Left: Maya modified skull at the Museo Nacional de Antropología e Historia, México (Photo Courtesy of Museo Nacional de Antropología e Historia, México). Right: Elongated skull, described by Egyptologists as the child of Amenophis IV/Akhenaten (Photo Courtesy of The Walters Art Museum). The parallel Mayan/Egyptian phenomenon of elongated skulls and cranial deformation has been known to scholars for centuries. Among both the Maya and the Egyptians, the practice seems to have been performed to differentiate the elite from the lower classes. The earliest descriptions of cranial deformation among the Maya were reported by Spanish chroniclers in the 16th century. In 1843, the American explorer John L. Stephens published Incidents of Travel in Yucatán, describing an artificially deformed skull that he found during one of his excavations. The nineteenth century archaeologist Augustus Le Plongeon (1826 – 1908), in his book Queen Moo and The Egyptian Sphinx, described the practice among the peoples of the Mayan cities of Copan and Palenque. Popular authors like Ignatius L. Donnelly (1831 – 1901), in his book Atlantis: The Antediluvian World, elaborated on Le Plongeon’s analysis. 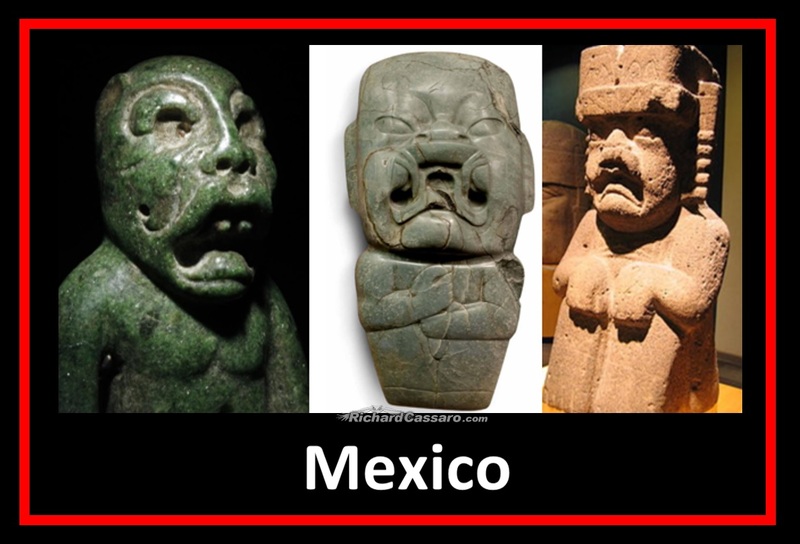 —A Look at Mayan Artificial Cranial Deformation Practices: Morphological and Cultural Aspects. The idea that the Mayan elite practiced cranial deformation is interesting because the Egyptian elite also seem to have performed a skull elongation technique, possibly for the very same reason of differentiating themselves from the lower classes or common people. Shown in the example above is a statue of an elongated skull from Egypt’s Amarna Period, the era of the reign of Akhenaten (1353-1336 BCE). The skull is described by scholars as belonging to the daughter of the Egyptian Pharaoh Amenophis IV, also known as Akhenaten. Artwork featuring Akhenaten’s daughters, Nofernoferuaton and Nofernoferure, with elongated skulls (c. 1375-1358 BC) is repeated in other pieces of Amarna art. Do the elongated skulls of both the Egyptian and Mayan “elite” point to a connection between the two civilisations? — The Sociopolitical History & Physiological Underpinnings of Skull Deformation,” Columbia University College. 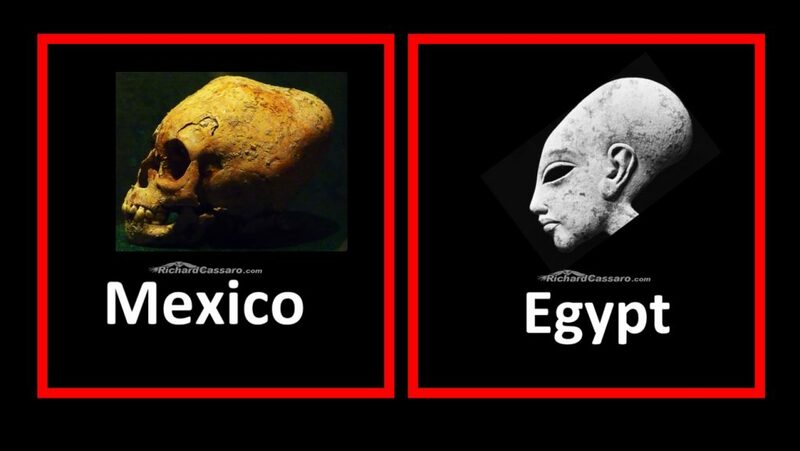 Admittedly, the idea that both the Mayan and Egyptian elite practiced cranial deformation to perhaps differentiate them from the lower classes does not directly connect the two civilisations. However, the fact that the pyramid-building Egyptians and Maya both practiced this strange technique is certainly provocative and indicates the possibility of a connection. Left: Example of a Mayan corbelled arch in Copan, Honduras. Right: Example of Egyptian corbelled arch inside the Red Pyramid near Cairo, Egypt. The corbel arch was used in both Mayan and Egyptian architecture. A corbel arch (also called “corbeled” or “corbelled arch”) is an arch that uses the so-called “corbeling” construction method to span a space or void. A corbeled arch is constructed by offsetting successive courses of stone (or brick) in such a way that they project towards the archway’s centre from each supporting side, until the courses meet at the archway’s apex. The gap at the apex is then bridged with a flat stone. The work of pioneering nineteenth century archaeologist and intrepid explorer Augustus Le Plongeon has largely been discredited because of its diffusionist basis. Le Plongeon insisted that the parallel corbeled arch was evidence that the world’s first cultures were children of a much older civilisation named Atlantis. Le Plongeon believed that the universality of the corbel arch in antiquity was strong evidence of shared wisdom across the Atlantic Ocean. —Lawrence G. Desmond, Augustus Le Plongeon: A Fall From Archaeological Grace. Left: Example of Maya glyphs in the museum at Palenque, Mexico. Right: Egyptian Hieroglyphs from the tomb of Seti I, c. 13th century BC. The Egyptians and Mayans both used hieroglyphs, consisting of pictographs or symbols, to express meaning in written language. Mayan writing, which is often described by scholars as the most sophisticated writing system in the pre-Columbian Americas, was dubbed “hieroglyphics” (or hieroglyphs) by early eighteenth and nineteenth century European explorers, including Augustus Le Plongeon, who noticed its similarity to Egyptian hieroglyphics. Egyptian hieroglyphs consist of phonograms, which are placed at the beginning of words to represent sounds, whereas ideograms are used to represent objects or ideas. Mayan hieroglyphs consist of pictographs written in neat blocks that include phonograms and ideograms. Is it possible that Mayan and Egyptian glyphs both evolved from the same “proto-language” or that perhaps one of them may have in fact served as an origin for the other? Obtaining a satisfactory answer to that question depends on the successful decryption of Maya writing, which has been made vastly difficult by the bonfires of the sixteenth century christian Conquistadors, who regarded the precious and irreplaceable Mayan scrolls as the work of the devil. (C) the Twin Serpent Motif. Left: The Codex Mendoza is an Aztec codex created c. 1541 depicting a warrior grasping the hair of a submissive captive. Right: The Narmer Palette depicts a pharaoh (usually identified as King Narmer) grasping the hair of a submissive captive. 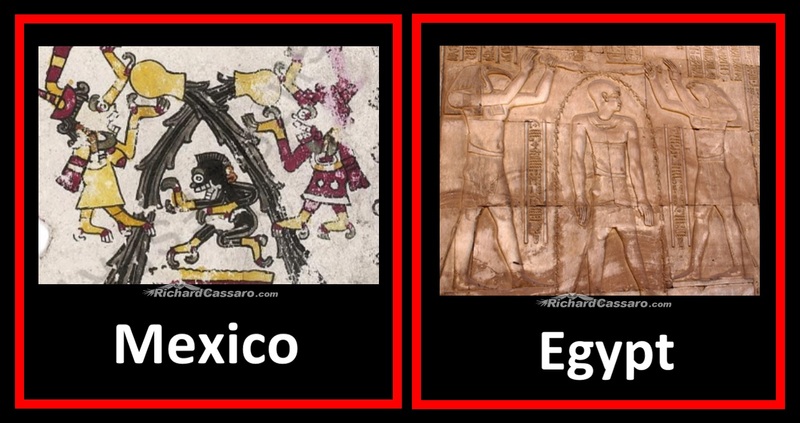 To be clear, this is not a Mayan/Egyptian parallel, but an Aztec/Egyptian one. However, the smiting scene is depicted on Mayan artefacts as well. When I first recognised this parallel motif in the late 1990s, I found it discouraging. Why? Because at the time, it seemed to me to convey barbarism. More precisely, the barbaric cruelty of a warlike people did not seem consistent with the metaphysically advanced and peaceful citizens (possible descendants of a highly evolved Golden Age mother culture) that I believed may have formed the bulk of Mayan and Egyptian society. However, as I continued to study this parallel “Smiting Scene” (Egyptologists call it a Smiting Scene, but Mayan scholars have no term for it), I became convinced that the scene does not depict the actual slaughter of one’s enemies. For a people as spiritual as the Egyptians to have created tens of thousands of Smiting Scenes (which appear abundantly in Egyptian culture, including on jewellery, furniture, amulets, and even on the walls of temples) did not seem in keeping with their high spiritual values. I came to believe instead that the scene could convey a metaphor—the slaying of one’s ego or inner demons, which is the real enemy of a spiritual seeker. In other words, the scene conveys a formula for slaughtering the physical animal nature of man (i.e., controlling or mastering the ego), which, as I explained in my 2011 book, Written in Stone, was a central doctrine in the ancient Egyptian religion and indeed in all of the world’s ancient religions. —John L. Sorenson, A Complex of Ritual and Ideology Shared by Mesoamerica and the Ancient Near East. It is difficult to state with certainty what this parallel scene meant to the Egyptians and Maya. Did it have the same meaning for both cultures? The Egyptian scene has become known among scholars as the “baptism of Pharaoh,” because they are inclined to believe that it might have been a purification ritual. Did the Mayan scene hold the same meaning? It is also possible that the symbolism shown here expresses the idea of initiation. Traditionally, the concept of initiation serves to reorient the individual away from his lower materialistic “animal” self. He is reoriented, instead, toward his higher “spiritual” Self and toward a more spiritual way of looking at the world. Water serves to cleanse, and it therefore appears possible that this parallel scene may depict a kind of initiation through cleansing, an idea that was apparently shared by both the Egyptians and Maya. Left: Aztec sculpture featuring twin serpents facing opposite directions, often described as “The Double-headed serpent,” in the British Museum. Right: Egyptian Aten or sundisk symbols like this one appear above the main entrances to Egyptian temples and feature twin serpents emerging from the solar orb, facing opposite directions. Note the similarity that these Mayan “serpent bars” share with the Egyptian Aten symbol, which adorns the lintels of some Egyptian temples, like Trojan’s Kiosk at Philae. Both the Mayan “serpent bar” and the Egyptian Aten symbol depict double-headed serpents connected back-to-back, facing opposite directions of left and right. In the first example provided, we see Aztec symbolism showing the same “joined” twin serpent motif or double-headed serpent motif. Interestingly, we see essentially the same symbolism in Egypt, where a giant solar Aten symbol (which I believe signifies the soul/source) crowns the middle between the serpents. Left: A “were-jaguar” statue from the early classic period (ca. 250 AD- 600 AD), Maya lowlands, Peten, Guatemala. Right: The Sphinx of Hatshepsut, Egypt. The Egyptians and Maya both created art and architecture depicting human beings transforming into, or having transformed into, felines. For the Egyptians, the feline was the lion; for the Maya, the feline was the jaguar. 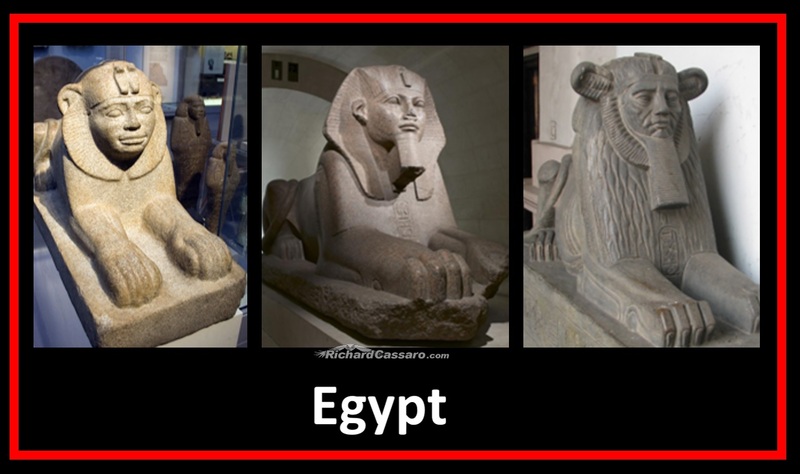 Side-by-side comparisons of an Egyptian sphinx (a mythical creature with the head of a human and the body of a lion) with what Mesoamerican scholars describe as the “were-jaguar” (as in “werewolf”) reveal many commonalities. The term “were-jaguar” is derived from Old English were, meaning “man”, and jaguar, a large member of the cat family prevalent across Mesoamerica. What exactly did this feline transformation theme on opposite sides of the Atlantic mean? Researchers and philosophers have sought to decipher the meaning of the mysterious and colossal Sphinx statue that was buried in the desert sands for centuries before it was dug up and polished off in the early 1800s. Most contemporary Egyptologists, like Dr. Mark Lehner and Dr. Zahi Hawass, believe that the Sphinx was carved out of an outcropping during the reign of King Khafre, c. 2500 BCE; but many writers and archaeologists in past centuries, such as R. A. Schwaller de Lubicz, a nineteenth century French Egyptologist, occultist, and student of sacred geometry, believed the Sphinx to be the relic of an earlier epoch in world history, an extremely sophisticated and advanced lost civilisation (perhaps “Atlantis”) in remote antiquity. Even today, there are many who do not agree with consensus estimates for the age of the Sphinx. 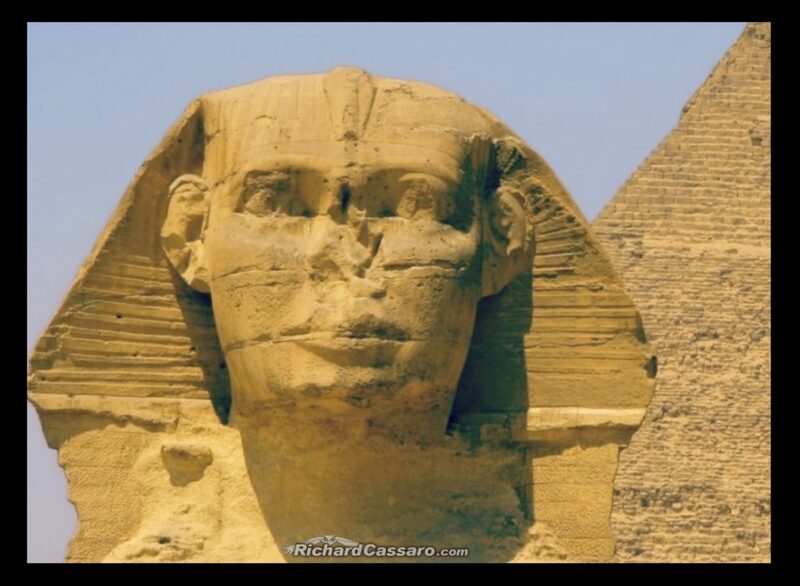 The late rogue Egyptologist John Anthony West (1932 – 2018), taking a page from Schwaller de Lubicz, pointed to water erosion on the sphinx statue and the Sphinx enclosure wall as evidence of the monument’s vast antiquity. Shown here are three Egyptian kings depicted as sphinxes, converted into felines. Left: The Sphinx of Taharqo, a Nubian king ruling the Kingdom of Kush (Photo Courtesy of the British Museum). Middle: Great sphinx bearing the names of Amenemhat II (12th Dynasty), Merneptah (19th Dynasty) and Shoshenq I (22nd Dynasty). Right: Pharaoh Amenemhat III in the shape of a Sphinx. Just like the Egyptians, the Maya and Olmec depicted themselves as felines (jaguars) in their art and architecture as evident in these figurines, which are typical of Mayan and Olmec iconography. —Dr. Nicholas Saunders, The Jaguar in Mexico. –Zahi Hawass, Mountain of the Pharaohs. Given the fact that Egypt’s pharaohs depicted themselves as sphinxes (i.e., half man half feline creatures), what are the chances that ancient Mayan kings and rulers also depicted themselves as half man and half feline creatures? Can this be mere coincidence? 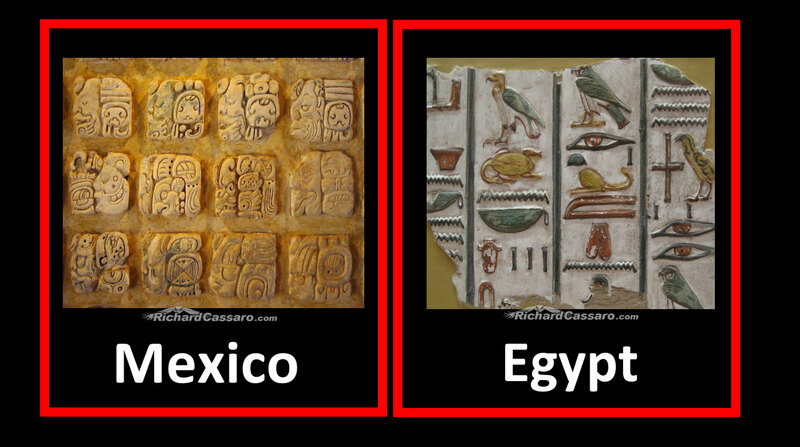 Or does this parallel iconography on both sides of the Atlantic Ocean reveal some type of unexplained link between the Maya and Egyptians? How did “human-into-feline-transformation” become a cherished motif among both Maya and Egyptian kings? For almost two decades, I’ve been pointing to the presence of Third Eye symbolism across the ancient world because I believe that the ancient art of “awakening the Third Eye” was a kind of universal religion that flourished in Antiquity, as-yet unrecognised by scholars. There is ancient evidence of the Third Eye in Hinduism, where the Third Eye is symbolized by a dot on the forehead above and between the two eyes. This Third Eye dot, called “bindi” / “bindu,” “urna” and “trinetra,” is visible on images of the Buddha, gods, and bodhisattvas. Is it possible that this same Third Eye symbol was known among ancient cultures outside Asia? I believe the answer is yes. On the left, we see two so-called “Chac” masks encoded in Mayan architecture. They are stacked on top of each other, and each mask wears a giant circular stone on the forehead. The stone is in the same position as the Hindu “bindi dot,” which in India symbolises the Third Eye, a state of awakening and enlightenment. On the right, in Egypt, the solar “aten” symbol crowns the forehead. In my opinion, the aten is a symbol of the soul / source. Shown here in the position of the Third Eye, the message is clear. According to ancient Hindu tradition, the act of awakening the Third Eye means awakening the eye of the soul and seeing the soul or source within. — Richard Cavendish, ed. (1994). Man, Myth and Magic – Volume 19. Ancient civilisations in the Americas, like the Maya and Aztecs (left), used the same forehead dot symbolism as Eastern cultures (right). 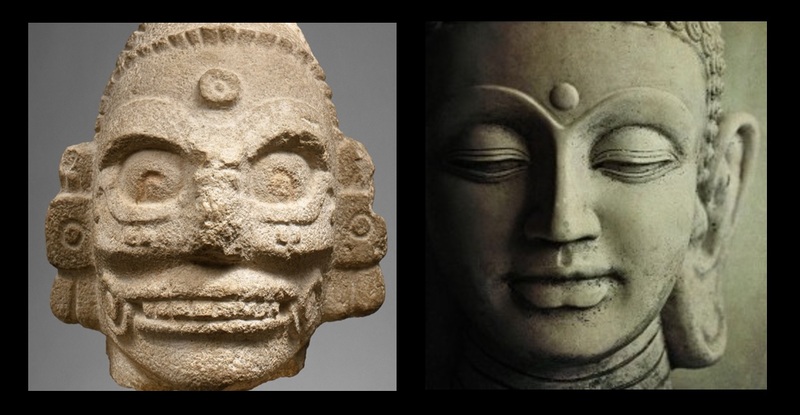 Left: Head of a “rain god” (as described by scholars), with Third Eye “forehead dot,” found at Chichen Itza, Mexico. Right: Buddha image shown with bindi Third Eye “forehead dot,” typical of Asian statues. Incredibly, and despite the fact that few scholars are willing to seriously entertain such a notion, the ancient Third Eye tradition of the Eastern hemisphere seems to have been a major cultural force in the Western hemisphere. 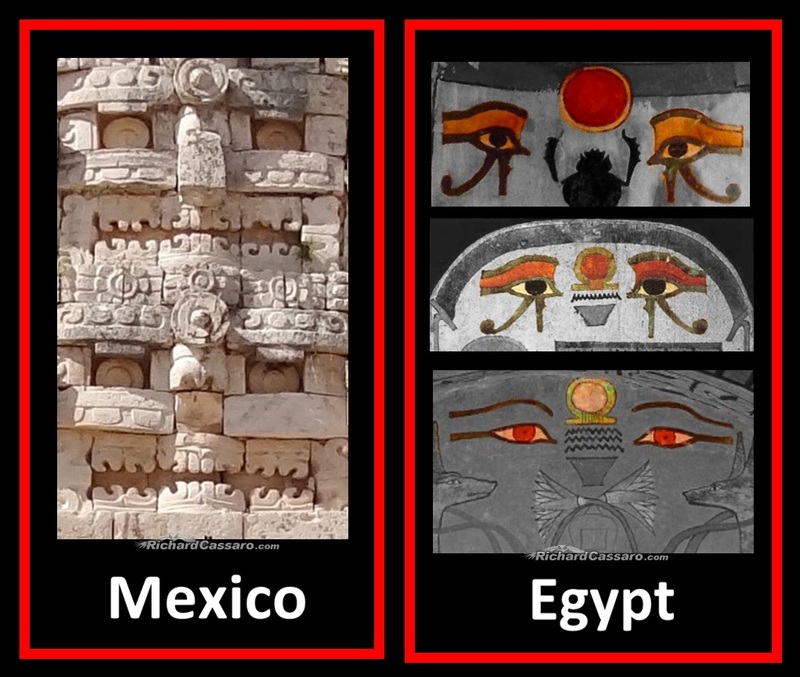 As I explained in Written in Stone, we find a very Asian-like pattern of Third Eye symbolism among cultures that evolved and flourished in present-day Mexico, Guatemala, Belize, El Salvador, Honduras, Peru, Ecuador, Columbia, Panama, Costa Rica and even the United States. These cultures include the Olmec, Toltec, Maya, Zapotec, Aztec, Inca, pre-Inca, and Mississippian cultures. For an overview of my research into the Third Eye among the ancient Egyptians, please read my article “Third Eye in Ancient Egypt”. Left: Twin jaguars enmeshed as one, depicted in front of the Governor’s Palace at Uxmal, Mexico. Right: The Egyptian Aker Lions glyph, depicted on the Egyptian papyrus of Ani (Photo Courtesy of the British Museum). The Maya and Egyptians both used the same “back-to-back” jaguars (Maya) and lions (Egyptians) motif. On the left, we see a statue in front of the Governor’s Palace at Uxmal, Mexico, depicting twin Mayan jaguars back-to-back. On the right, in the comparative image above, is a famous Egyptian “hieroglyph” or “god” or “motif” called Aker, depicting back-to-back twin lions. —Pat Remler, Egyptian Mythology, A to Z. A famous explanation of the Aker Lions was provided by Schwaller de Lubicz, a student of Egyptian symbolism best known for his twelve-year study of the Temple of Luxor, who wrote that the image represents the “present” moment in time (symbolised by the solar Aten symbol) in comparison to the “past” and “future” (symbolised by the twin lions). Schwaller de Lubicz indicated that the lion on the left corresponds to “yesterday” and faces west, while the lion on the right faces east and represents “tomorrow.” With the eternal sundisk (which I believe symbolises the “soul within” or “higher Self”) centred between the dual opposing lions, de Lubicz hypothesised that the entire Aker Lions hieroglyph seems to signify the “Eternal Now” moment. The idea of an “eternal present” moment or the “eternal now” moment is a central concept in Eastern spiritual teachings and occult philosophy. It goes by the name “non-duality,” and we find it in Advaita Vedanta, Ch’an Buddhism, Zen, Taoism and Sufism. —Sanghamitra Dasgupta and Dilip Kumar Mohanta, Indian Philosophical Quarterly # 25. There is a symbol in Mayan art and iconography that is similar to the Egyptian Aker Lions hieroglyph. This Mesoamerican counterpart depicts the image of twin jaguars and twin jaguar-like humans. Like the Aker lions in Egypt, the Mesoamerican jaguars are facing opposite directions, which, in my opinion, indicates that they symbolise duality. In some cases, not only are the jaguars lying back-to-back (close together and facing opposite directions) just like in Egypt, but they are also lying in such a way that their physical bodies are enmeshed. This gives the impression that their duality has been united, and they have combined into a single being—a double-headed jaguar. Top left column: Maya statue depicting twin jaguars back-to-back in front of the Governor’s palace at Uxmal, Mexico glyphs. Middle Left Column: Twin jaguars shown back-to-back on the Nunnery at Uxmal, Mexico. Bottom left column: Twin sphinx-like humans shown back-to-back depicted on the Pyramid of the Magicians at Uxmal, Mexico. Right column: Egyptian Aker Lions glyphs from Egyptian papyri. Did this “twin jaguar” symbol have the same meaning among the Maya as the Aker Lions symbol among the Egyptians? Based on this symbolism, one could argue that Egypt’s Aker Lions symbol signifies the unification of opposites into the centre principle, the Aten or sundisk, which I believe symbolises the soul. In my book, Mayan Masonry, I present detailed evidence for the notion that in Mexico, the twin jaguar motif symbolises the unification of opposites into a kind of centre principle, where the two jaguars become a single and more powerful entity. This reflects a deep, metaphysical wisdom teaching that explains the concept of nonduality. Le Plongeon found an even more amazing similarity that ties the Egyptian and Maya cultures to each other, and to Freemasonry. 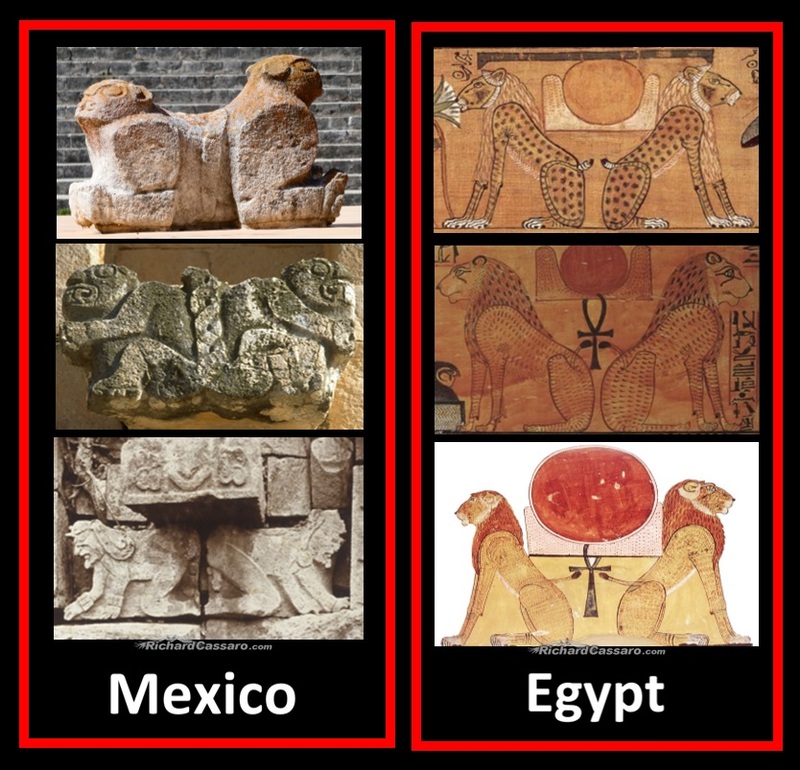 In his book, Sacred Mysteries Among the Mayas and the Quiches, Le Plongeon expressed his belief that the Egyptians and Maya used the very same Tau cross in a way that made him believe it had the same meaning in both Egypt and Mexico. 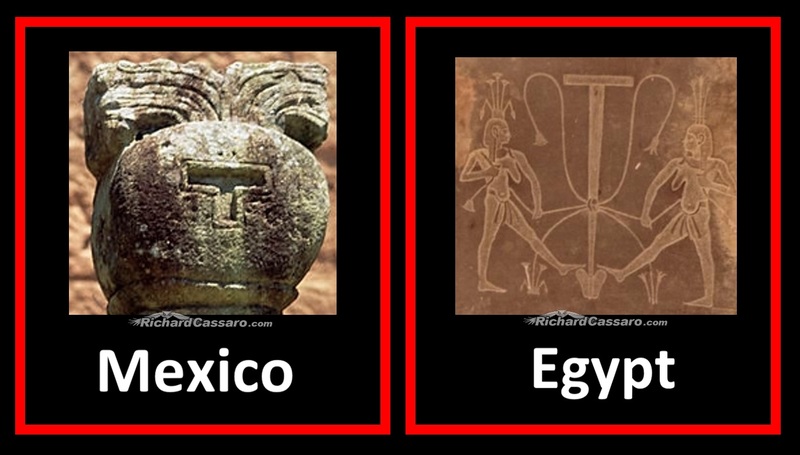 The Tau was a symbol used by ancient cultures in Greece, Ireland, Spain, Egypt, and Mexico (see image below). Its use by the Egyptians and Maya fascinated Le Plongeon. How did both cultures, separated by the Atlantic Ocean, come to adapt the same Tau cross for thousands of years? —Augustus Le Plongeon, Sacred Mysteries Among the Mayas and the Quiches. For the Maya and Egyptians, the Tau was no insignificant object. They used it in their art, architecture, funeral rituals, ceremonies, on their altars and thrones, in their jewellery, and they depicted themselves and their gods holding the symbol on statues and reliefs, as shown in the images above. In 1994, the uncovering of T-shaped stone pillars among the world’s oldest dated megaliths at the famous archaeological site of Göbekli Tepe provided stunning confirmation that the Tau cross played a major role among the most ancient civilisations around the world. Tau-shaped “T” pillars at the ancient site of Gobekli Tepe, depicting human arms and hands shown in relief. —Oliver Dietrich, The Tepe Telegrams. Incredibly, the Egyptian Tau cross was sometimes personified—depicted with arms and legs. Left: The Egyptian Tau Cross was often shown personified; here it is depicted with arms on an ancient Egyptian wall frieze at the Temple of Sobek and Haroeris, Kom-Ombo. 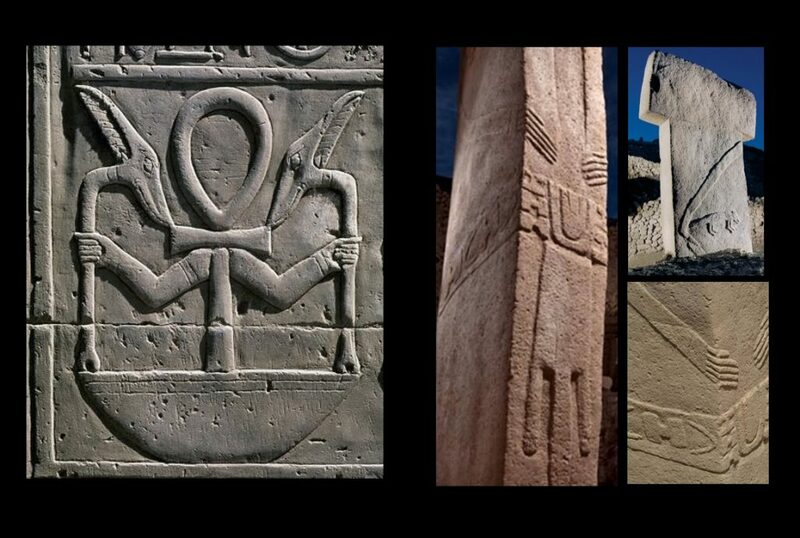 Right: The T-shaped pillars of Göbekli Tepe—which I believe symbolise the Tau Cross—are shown in human form. That Gobekli Tepe’s T-shaped pillars and ancient Egypt’s Tau cross were both anthropomorphised provides compelling evidence of a possible, even likely, connection between the two cultures. This powerful cross symbol has, of course, been appropriated by Christianity. Left: Upper Temple of the Jaguars at Chichen Itza, Mexico. Right: Trajan’s Kiosk at Philae, Egypt. I researched the ruins of Triptych Temples all over the ancient world—and most pronouncedly among the pyramid cultures—in the late 1990s, and, as demonstrated in my 2011 book Written in Stone, these temples all celebrate the same universal religion (Perennial Philosophy) of non-duality that was shared across all of antiquity. Left: Pyramid of Kukulkan, Chichen Itza, Mexico. Triptych Temple of the Turtles in Uxmal, Mexico. Middle: Pyramid of Saqqara, Egypt. Triptych Temple of Seti II, Karnak, Egypt. Right: Koh Ker pyramid in Cambodia. Triptych Temple at Ta Prohm in Cambodia. The pyramid-cultures all built “Triptych” three-door temples, with a wider and taller middle door than the two flanking it. The abundant occurrence of the Triptych across the ancient world is not a random coincidence. The Triptych represents more than merely an architectural element; the Triptych is the chief symbol of an advanced universal religion (perennial philosophy) that was once shared globally in antiquity, mainly by the pyramid cultures. In my books, I have shown how the twin outer doors of Triptych Temples symbolise duality, or the “pairs of opposites”; the centre door symbolises the unity of the twin outer doors or the “balance of duality” (i.e., non-duality). Left: Temple of the Turtles, Uxmal, Mexico. Right: Temple of Seti II in the atrium of the temple of Karnak, Egypt. — Henri Frankfort, Kinship and the Gods, 1948. The discovery of the Triptych provides evidence that ancient cultures worldwide shared the same spiritual beliefs, and that they encoded their beliefs in the parallel Triptych Temples that they designed and built. This discovery suggests that these cultures descended from the same remote parent source. The ancient Mayan and Egyptian cultures do not seem to have been in contact with one another. There are no records of trade or warfare or any other types of trans-Atlantic communication. What’s more, there are many differences between the two cultures that are just as powerful as their similarities. 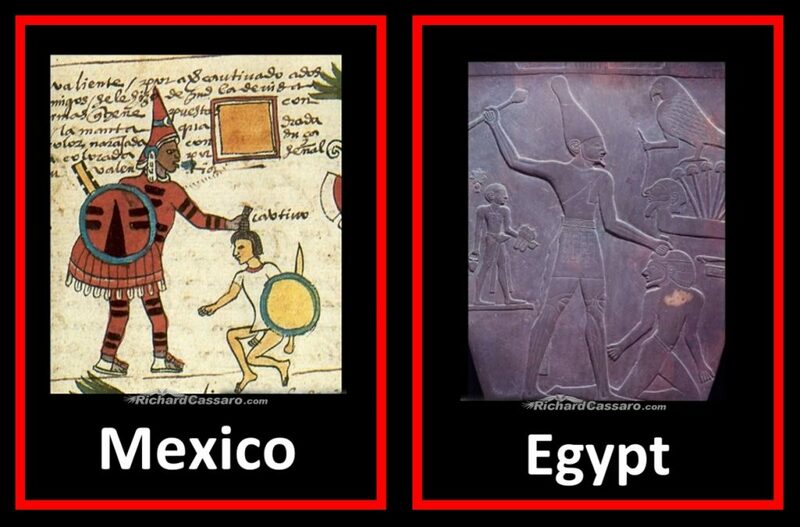 For example, the Mayan ball game was a central feature of their culture; I have never heard of any Egyptian ball games. Also, the art of mummification does not seem to have played a key role in the Maya funerary ritual, as it did in Egypt. To compare the two civilisations is at first blush manifestly unfair to the Maya, who were denied their say in history by both their isolation from the rest of the civilised world and because of the intentional destruction of the lion’s share of their cultural patrimony by the Spanish conquistadors. We will most likely never be able to read about the great exploits of the Maya counterparts, if such ever existed, to those of Cleopatra, King Tut, Rameses and Akhenaten. Nonetheless, there is ample reason to believe, based on the striking parallel iconography and cultural phenomena I have presented here and elsewhere, that both civilisations evolved from the same more ancient parent culture or source civilisation—a mother culture so old that it has now been lost to time. Both cultures seem to have somehow shared the same religious tradition—as if they started off with the same body of metaphysical wisdom, albeit expressing this wisdom in slightly different ways, using their own “local dialect” in a sense. This is the theory that I put forth in my 2011 book, Written in Stone, and further flesh out in Mayan Masonry, where I look at several more profound Mayan and Egyptian parallels, as well as a panoply of other remarkable parallels shared by the Maya and other ancient civilisations. Is it possible that these civilisations may be children of the same Mother Culture? Could they have descended from the same more ancient source without knowledge of each other? I think the astonishing answer may well be yes! As to what that Mother Culture was, and how it spread its tentacles throughout the ancient world, we don’t have all the answers yet. Despite some intriguing recent finds and reinterpretations of ancient artefacts, the source of ancient religious belief remains elusive in many respects; but I’m still digging and still sorting through a continuously-updated database of archaeological information. Watch this space! Richard Cassaro is a Madrid-based author, lecturer, documentary filmmaker, and tour guide from New York City. 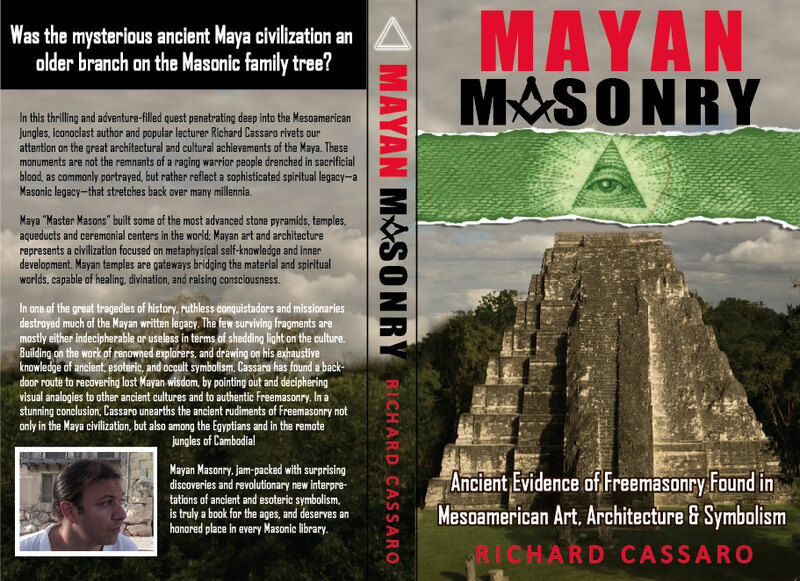 His published books Written in Stone (2011), The Missing Link (2016), and Mayan Masonry (2018) offer rare insights into ancient megaliths, spirituality, mythology, magic, symbolism, secret societies, comparative religion and occult archaeology. 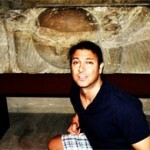 Cassaro has discussed his work on the History Channel, and in documentary films including Magical Egypt 2. His articles have appeared in print journals and web media around the globe; and he has delivered well-received lectures about his findings in England, Italy, Peru, Egypt, Spain, Mexico, Cyprus, and the U.S. In his capacity as a field investigator, he hosts travel adventures to archaeological sites worldwide. Ayer A, Campbell A, Appelboom G, Hwang BY, McDowell M, Piazza M, Feldstein NA, Anderson RC., “The Sociopolitical History & Physiological Underpinnings of Skull Deformation,” Neurosurgical Focus (2010). Brunhouse, Robert L., In Search of the Maya (University of New Mexico Press, 1973). Cassaro, Richard, Written in Stone (Deeper Truth Books, 2011). Dasgupta, Sanghamitra; Mohanta, Dilip Kumar, Indian Philosophical Quarterly, 25 (1998). De la Garza, Mercedes, Maya, (Rizzoli, 1998). De Lubicz, Schwaller R.A., The Temple in Man (Inner Traditions paperback, 1981). Desmond, Lawrence Gustave, A Dream of Maya (University of New Mexico Press, 1988). Dietrich, Oliver,“The Current Distribution of Sites with T-Shaped Pillars” (The Tepe Telegrams, 2016). Donnelly, Ignatius, Atlantis: The Antediluvian World (Harper & Brothers, 1882). Feder, Kenneth, Frauds, Myths, and Mysteries (Oxford University Press, 2017). Feder, Kenneth, Encyclopedia of Dubious Archaeology (Greenwood Publishing Group, 2010). Frankfort, Henri, Kingship and the Gods (Oriental Institute of the University of Phoenix, 1948). Hancock, Graham, Magicians of the Gods (Thomas Dunne Books, 2015). Hawass, Zahi, The Secrets of the Sphinx (The American University in Cairo Press, 1998). Helferich, Gerard, Humboldt’s Cosmos (Gotham Books, 2004). Higgins, Frank, Ancient Freemasonry (Kessinger Publishing, 2010). Hornung, Erik, The Secret Lore of Egypt (Cornell University Press, 2002). Lehner, Mark, The Complete Pyramids (Thames and Hudson, 1997). Le Plongeon, Augustus, Queen Móo and the Egyptian Sphinx (Published by the Author, 1900). Le Plongeon, Augustus, Sacred Mysteries Among the Mayas and the Quiches (Theosophical Publishing Company, 1909). Le Plongeon, Augustus, The Origin of the Egyptians (The Word Magazine, Vol. 17, 1913-1914). Nuttall, Zelia, The Fundamental Principles of Old and New World Civilizations (Peabody Museum of American Archaeology & Ethnology, 1901). Remler, Pat, Egyptian Mythology, A to Z (Chelsea House Publishers, 2010). Romero-Vargas S1, Ruiz-Sandoval JL, Sotomayor-González A, Revuelta-Gutiérrez R, Celis-López MA, Gómez-Amador JL, García-González U, López-Serna R, García-Navarro V, Mendez-Rosito D, Correa-Correa V, Gómez-Llata S., “A Look at Mayan Artificial Cranial Deformation Practices: Morphological and Cultural Aspects,” Neurosurgical Focus (2018). Saunders, Nicholas, The Jaguar in Mexico. Sorenson, John L., “A Complex of Ritual and Ideology Shared by Mesoamerica and the Ancient Near East,” Sino-Platonic Papers (2009). Spinden, Herbert Joseph, Ancient Civilizations of Mexico and Central America (New York American Museum Press, 1922). Stevens, John Lloyd, Incidents of Travel in Central America, Chiapas and Yucatán (Cambridge University Press, 2010). Wauchope, Robert, Lost Tribes and Sunken Continents (University of Chicago Press, 1962). West, John Anthony, Serpent in the Sky (Quest Books, 1993). Wolfgang von Hagen, Victor, Maya Explorer (University of Oklahoma Press, 1947). Personally Richard I suspect it may connect those two civilizations as much as the other evidence. Think about it. Why would two separate groups struggling with daily existence not only come up with the same idea of deforming their kids’ skulls but then spend god knows how many years – how many generations for that matter! – experimenting with countless methods and techniques until they finally achieved a methodology and a transformed adult to justify the whole process? Great article. Just one thing though, apologies for being pedantic but the song ‘Ebony and Ivory’ is sung by Paul McCartney and Stevie Wonder, not Michael Jackson. Excellent!!! Three for three. A most worthy addition to the other two, “Written in Stone” and “Missing link.” There’s something about that Triptych stuff and stoneware, to be sure. Your books and web site and observations are three invaluable resources to take along on masonry related explorations. Some basic HTML is allowed.